Motivated by the mouth-watering aromas and seasonings that only come with cooking on outdoor barbecues and grills, the act itself has evolved into a favorite at-home activity. Whether it's a small family meal or a weekend party, having an actual well-equipped kitchen is at the top of many homeowners' list of home improvements. Climate: Some appliances need to be protected from harsh climates and extremes in temperature. Additional features like pizza ovens, beer dispensers, ice machines, smokers, and patio heating will add more to the final cost. Many outdoor "all-weather" kitchen appliances cost more than indoor models. Take a look at these 50 outdoor kitchen designs that should help you cook up some ideas for your own outdoor space. A four-bedroom modern home designed by CleverHomes in Burlingame, California includes a spacious outdoor kitchen, accessible via expansive bifold doors that connect the interior and exterior spaces of the home. A gas grill with granite countertops and custom cabinetry is framed by large stone pillars that also frame the view to the garden and support a large wood roof covering that provides shelter for a large hardwood deck. Electric Bowery designed an open-concept floor plan for a home in Venice, California. Sliding glass walls lead to a loggia with a built-in grilling station and fire pit. 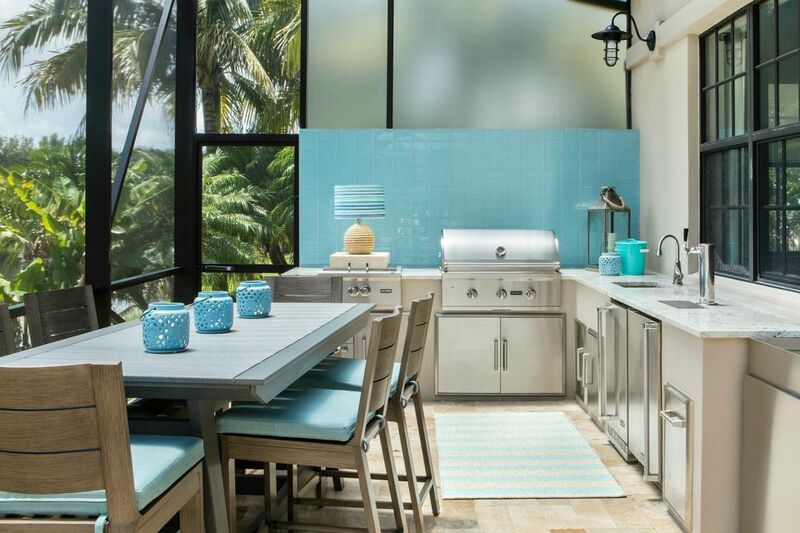 Soft blues that reflect the sky and nearby ocean give this Ft. Lauderdale, Florida kitchen designed by Blue Sky Environments Interior Design a cheerful and colorful feeling. A built-in grill and countertop with a sink, refrigerator, and cabinets is accented with a stunning blue tile wall/backsplash. Torrey Pines Landscape Co. in San Diego County transformed a plain outdoor kitchen for a house on Coronado Island into something functional and beautiful that reflects the homeowners' outdoor lifestyle. Featuring a flagstone surface, the kitchen includes a grill, oven, refrigerator, sink, cabinets, countertops, and a bar. EAG Studio created a sustainable LEED Platinum house in San Francisco's Noe Hill that makes smart use of limited outdoor space. The kitchen center offers sweeping views of the city and includes a grill, refrigerator, sink, workspace, and cabinets. A covered patio with limestone flooring and Somerset columns features a clever hideaway kitchen building that measures about 8-by-12 feet and is accessible via Simpson sliding barn doors. Designed by Rill Architects, the project includes kitchen storage located behind the counter and grill and accessed by a door around the corner. Protecting outdoor kitchen appliances in climates like metropolitan Washington, D.C. helps prolong their use. The Burnett River House designed by Tomas O'Malley Architect in North Brundaberg, Queensland, Australia features large sheltered outdoor spaces, including a kitchen that provides protection from the elements while cooking with the pleasure of spending time outdoors. A curving unit that includes a stone fireplace, built-in seating, and kitchen were created for this San Francisco backyard by Derviss Design. Wood fencing/privacy panels and pergolas mix beautifully with the stone. A fully equipped stone kitchen designed by Alterra Landscape Architects features a modern interpretation of living close to the land. For this San Francisco area family, it means growing food in their garden, cooking dinner outdoors for friends and neighbors, and enjoying evenings by the fire. Five years after renovating a historic country house in In King George, Virginia, the homeowners asked McInturff Architects to add a pool/guest house. Influenced by 18th-century farm dependencies and summer kitchens, McInturff designed a complete, primarily open-air house that could be used during warm weather. The one-bedroom, one-bathroom structure includes an outdoor kitchen with a Viking grill and hood pendant lights, all housed under timber louvers. A reclaimed brick porch features a kitchen neatly tucked on one end that does the job without obscuring the view. Designed by Stone Acorn, this Houston outdoor kitchen features nice appliances that include a DCS gas grill and hood to provide proper ventilation. An open bar area creates a casual place to dine or hang out while the chef cooks in the kitchen of this home in Highlands, North Carolina. Futral Construction used Tennessee Crab Orchard stone that they bought in large slabs, which worked well for this project. The ceiling is made of pine. Random rectangular Pennsylvania flagstone sets a striking surface for an outdoor kitchen in Potomac Falls, Maryland. Clearwater Landscape & Nursery designed this space on a large lot that is equipped with a grill, refrigerator, and countertop to take in the surrounding view. An outdoor unit is set at an angle and includes a pergola that holds hanging containers of colorful flowering plants to blend with the surrounding landscape. Forest Ridge Landscaping incorporated a grill, refrigerator, counter, and covered stove into the fully equipped feature. Situated under a large heritage oak tree, an outdoor kitchen and dining room created by Urrutia Designs features a table that seats 10 and is built of redwood, as are the cubes, cabinet doors, and guard railings. A kitchen unit made with Napa Cobblestone culled from local fields includes a concrete countertop, Viking rotisseries/range, and U-Line undercounter refrigerator. A traditional brick kitchen unit from Derviss Design features stainless steel cabinets, a grill, countertops, and a pergola with festive string lights. Brick is one of the most popular and easiest masonry materials to work with. Backyard space is often limited at homes in densely populated cities surrounding Los Angeles. Electric Bowery cleverly used a sidewall of a Santa Monica house to build a long grill space with built-in counters and cabinets underneath. A Mediterranean-style outdoor kitchen designed by Sterling Brook features a large stainless grill, under-cabinet refrigerator, and a stainless pull-out trash bin. Granbury stone surfaces and Ubatuba granite countertops are topped by a cedar pergola. Travertine pavers set in a herringbone pattern extend to all of the outdoor areas around the adjacent pool. An open-air room at a house in Perth, Australia was designed by Outside In. The living space features a stainless steel Matador outdoor kitchen with a nearby granite dining table. A covered backyard porch extends this Houston home's living space and allows the owners to cook and hang out when things heat up. Stone Acorn built a reclaimed-brick kitchen unit that matches the home's facade. Wisconsin-based Vive Home Transformations brought an open, Big Sky State sensibility to a new home in the Midwest for clients who moved from Montana and loved the outdoors. A too-small patio was redesigned to incorporate more indoor-outdoor living space for the homeowners to enjoy the beautiful setting. Retractable vinyl walls and screens can be opened in sunny weather; when it gets humid or windy, the walls and/or screens can be closed without disrupting the view. There's a colorful surfboard propped against a wall just around the corner from this outdoor kitchen created by Point 2 Design of Sydney, Australia. The sleek grill and prep area features a modern wall with cutouts as a backdrop. A 22-by-50-foot covered patio with sand-set tumbled limestone pavers houses a kitchen with an elegant Southwestern backsplash that is dramatically illuminated at night. Designed by Tate Studio, the home is in Phoenix, Arizona. Concept Builders designed an outdoor kitchen with all the bells and whistles, protected from Seattle rains by an open-gable roof that also covers a living room and matching stone fireplace. A curving kitchen and fireplace outdoor feature by Derviss Design is built with true blue New England bluestone, while the counter is honed-finish granite. An intricate inlaid-wood overhead designed by Texas Custom Patios houses a complete outdoor kitchen for cooking meals to enjoy by the fire. This Sacramento, California kitchen is so completely equipped, it would be hard to find a reason to not cook outside most evenings. From Reynolds Gualco Architecture-Interior Design, the efficient workspace includes a grill, refrigerator, cabinets, sink, wine cooler, covered stove, and much more. Outdoor pizza ovens are an increasingly requested item for outdoor kitchen projects and Barkman Concrete satisfied its client's order with a cohesive stone bar, kitchen, and oven in a patio that was made for eating and entertaining. The chef stays in the middle of the action of this stacked-rock outdoor kitchen designed by Georgio Home of Westchester County, New York. Overhead lights help the chefs see what they're doing on the grill in the dark. An adobe-style oven with a rounded top gives a special flavor to pizzas, bread, and roasts. That curvilinear form is repeated in the kitchen island; all by Derviss Design. Continuing the horizontal lines and clean, modern design of this Lilyfield home in Sydney, Australia, this covered room provides overhead shelter for the kitchen. From Pilcher Residential, the vent was smartly designed to code and for safety. A soft, earthy palette makes this outdoor space in Encino, near Los Angeles, an inviting and relaxing place to unwind or entertain. Von Fitz Designs used flagstone for the patio and a similar colored large stone for the custom kitchen and fireplace. While this kitchen island counter is a standard 36 inches, Hursthouse Landscape Architects raised the bar to 42 inches to accommodate standard tall chairs. The backsplash is created with a row of vertically laid bricks and a bullnose coping to match the bullnose edge of the honed-bluestone countertops. A property in California's wine country features a pavilion designed by John Montgomery Landscape Architects that features chiseled countertops, a full kitchen, ceiling fans, heaters, and a breathtaking view. The comfort and convenience of cooking and relaxing continues on this Houston back designed by Stone Acorn Builders. Vintage brick is used for the flooring and kitchen unit. A large kitchen and outdoor entertaining space from CC Designs in Denver, Colorado features General Shale Sequoyah stone, Mediterranean Boardwalk tile, a cedar ceiling, Contempo fireplace, Lynx grill, and Minka light fixtures. Since the indoor kitchen is nearby, the homeowner opted for just a grill, hood, and workspace. Rough stone set in buff mortar was used by B&B Pool and Spa on the outdoor fireplace, kitchen, and low walls for a cohesive look that blends well with this elegant sprawling farmhouse in Bernardsville, New Jersey. A classic L-shaped kitchen island is set against a wall toward the back of this Los Angeles area property. Designed by Globus Builder, it includes additional counter space and storage under the gazebo. Proving you can do wonders with a limited hillside lot, the team involved in the design of this Austin home and yard incorporated an outdoor kitchen with bar seating, along with a dining area with views of the pool. The home was designed by Hobbs' Ink and the builder was Triton Homes. While the fire pit is the focal point of a patio at a country house in Loveland, Colorado, a pergola-covered kitchen is just steps away to grill bison burgers and beans to enjoy while sitting 'round the fire. Designed and built by Highcraft Builders, the kitchen is constructed of stone and features a built-in grill, plenty of workspace, and a covered picnic table. A colorful kitchen becomes a focal point in this stunning desert backyard masterminded by Prideaux Design to make smart use of a very small space with shared walls. The vibrant, glossy tile backsplash contrasts with the rough ashlar stone of the kitchen's base. Completely covered overhead, but still an outdoor room, this space designed by Texas Custom Patios features a fully equipped brick kitchen with a raised bar and chairs for hanging out with the grillmaster. Redesigned and rebuilt after a fire, Shuler Architecture came up with a new outdoor space for the owner of this Mercer Island, Washington, waterfront home. A grill with a vent and small counter and storage space was positioned next to a charming fireplace constructed with El Dorado stone veneer. Tucked in the corner of a patio is a kitchen with all the necessities but nothing to block the view. Luminosus Designs used slender lights that shine on the prep spaces but don't take up much room. A raised covered patio designed by Dena Brody Interiors is built for fixing complete dinners and entertaining, fit for a Texas-sized group of family and friends. Stone veneer was used for a wall and base of an outdoor kitchen created by Paradise Found of Portland, Oregon. An L-shaped stacked-stone kitchen provides plenty of space for more than one outdoor chef of this San Francisco yard designed by John Montgomery Landscape Architects. A pool house was Fluid Design's clever solution for locating an outdoor kitchen at a home in Sydney, Australia. Like a destination in a backyard, this covered patio designed by Texas Custom Patios includes a kitchen, bar, fireplace, TV, and deep-seating set for escape and entertainment.